Not sure whether or not your vintage Chanel jewelry is authentic? Want to know which year your Vintage Chanel jewelery was made? Vintage Heirloom take a look into the history of Chanel jewelry date stamping, and give you some useful tips on how to find out the year of your vintage Chanel jewelry. Unfortunately at the start of designing jewellery, Coco Chanel did not date stamp any of her accessories. Jewellery was included and sold as part of an outfit, so it is speculated that Coco purposely didn’t want jewellery to be marked as a stand alone piece and instead was to be worn to compliment her designs. The only pieces to be marked during this time period were in 1941 when an American costume jewellery company started operating under the name ‘The Novelty Chanel Company’. This was during the period Coco Chanel had closed her shop doors due to World War II. The house of Chanel protested this line of jewellery with the trademark Chanel, and production was ceased. 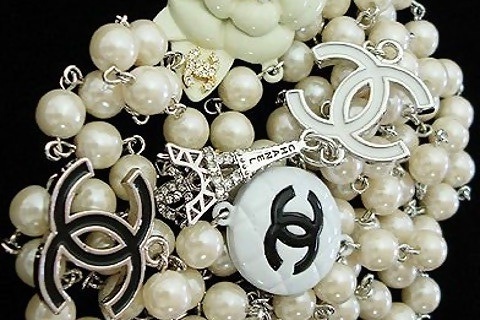 The company changed its name to ‘Reinad Novelty Company’, and although these pieces are not official ‘Chanel’ pieces, they are still sought after. In 1954 Coco Chanel, reopened her Parisian boutique due to the end of World War II. Coco Chanel continued to sell much of her jewellery unmarked and was sold to compliment her designs. Robert Goosens was employed by Chanel around this time, to help with the design of Chanel jewellery, and it was at this period that saw Chanel jewellery being stamped for the first time. The wording ‘CHANEL’ was used, and also the same wording with three little stars underneath. It is unclear how it was decided which items received which stamp. These two stampings were used up until 1971 when Coco Chanel passed away. On necklaces, the same stamp was used, but the circle wrapped around a link, resembling a semi circle like shape, highly unnoticeable, unless you were to examine the jewellery closely. In 1980’s, the stamp changed slightly, due to the introduction of Karl Lagerfeld as head designer. For the first time the date was added underneath the CC logo, and ‘made in France’ removed. The copyright c was moved to the bottom before the year of manufacture date. During 1993 the plate was redesigned again, to specifically tell you what season, and year the jewellery was manufactured. Replacing the number of a season, the last two digits of the year were added to the left of the CC logo, and the the right, an ‘A’ or ‘P’ indicating, Automne, (french for Autumn) or Printemps (french for Spring). Today as well as A & P markings, jewellery is stamped with C for Cruise, or S for summer, although these are seen less frequently than the bigger Spring and Automne stamping, due to them being larger shows. The stamping is usually seen on the back of jewellery but occasionally can be found hanging from a tag on a bracelet. More recently manufactured pieces will feature ‘Made in Italy’ instead of ‘Made in France’ due to manufacturing change in location. The date marks provide us with accurate information, as Chanel has been designing and selling jewellery for over 90 years.